An opportunity arose this week for me to travel to Florida to visit my grandmother. I couldn’t pass it up. But a last minute change in plans also meant that I needed to scramble to get other tasks wrapped up before my trip. My biggest challenge: to complete my submissions for the Loft Literary Center’s Mentor Series. One of the things I love about living in the Twin Cities is being so close to the Loft. I have access to writing classes year-round, I can be a part of an inspiring and supportive writing community, and I can attend readings from some of the most influential authors and poets. For a writer, walking into the Loft is like opening the doors to Utopia. Among the opportunities the Loft provides to the Minnesota writing community is their annual Mentor Series in Poetry & Creative Prose. There are three categories to which you can apply: poetry, fiction and creative nonfiction. Four writers are chosen from each category to work with two mentors (who are nationally acclaimed writers in that category) for one year. This is my third year applying, however, this year, I decided to up the ante and apply in two categories: poetry and creative nonfiction. The deadline is April 30th, but I’ll be in Florida that day collecting pecans out of my grandmother’s backyard to make a pecan pie, so I needed to pull a few late nights and get my submissions completed early. And, I am happy to announce that as of noon today, I officially handed over my packets containing 17 pages of poetry and 18 pages of creative nonfiction to the Loft office. Now I guess I need to think about packing since I leave tomorrow. Last minute schedule changes are something that everyone can relate to. And quite often, they affect our meal plans. 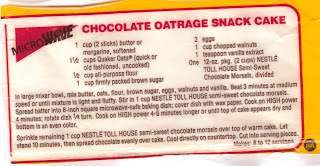 But I was happy to find a recipe in the box that accommodated a hectic lifestyle: Chocolate Outrage Snack Cake. 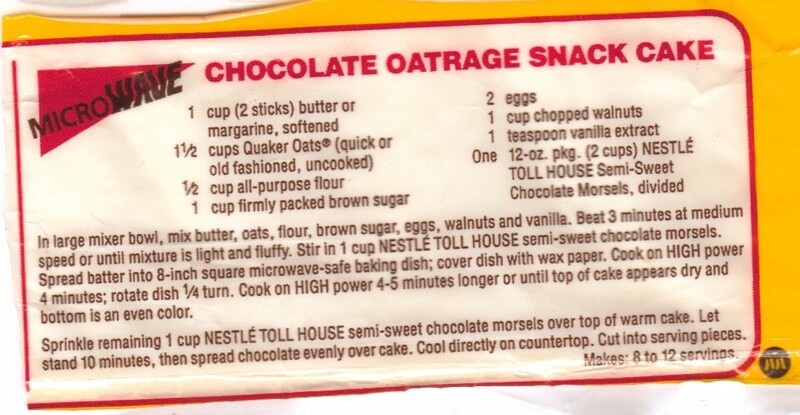 This is actually a microwave recipe from a Nestle Tollhouse Chocolate Chip package. I’m not sure of the exact date this recipe was published, but it was quite a different baking experience than the 1930’s recipes I have been making. From start to finish, this dessert can be made in about 15 minutes. I’ve never used the microwave as a baking tool and I have to admit that I was skeptical of how this would turn out. But I was pleasantly surprised when I took a bite. This dessert is basically a gooey chocolate chip oatmeal cookie bar. I’d recommend eating it when it’s still warm because it literally melts into your mouth and chocolate flows into every nook and cranny from the tip of your tongue all the way down your throat. Yum! It definitely makes you stop and take a moment to enjoy the chocolate indulgence before you run off again in ten different directions. Speaking of which, I need to pack! I’ll be in the car for almost three days each way so I need to collect a stack of books to read (I’m one of the few lucky people who can read in the car). Now which ones do I choose…? I have one more recipe to post before I go, but then I won’t be able to post again until the first week in May. I will be updating The Found Recipe Box page on Facebook though! (If you haven’t become a fan yet, be sure to check it out.) Maybe I’ll even come across a recipe box in Florida that needs a home. I’d love to have recipes for all of that amazing southern cooking!